Now and then it’s nice to read a sweet little book. Not saccharine, not cloying or tooth-rotting. Just easy, relatively stress-less, small in size, simple in design, and rich in implication and capacity for wonder. Not taxing, but provocative in the best ways. My old friend and professional mentor, the late Carroll Theron “Ted” Hartwell, used to refer to “sweet little pictures” that he had acquired for The Minneapolis Institute of Arts’ permanent collection. The photographs he mentioned were more gentle than manly, pictures that were a bit emotive, whimsical, intimate, even vulnerable in their presentation. This post recognizes and pays tribute to Ted’s unapologetic embrace of the sweet. 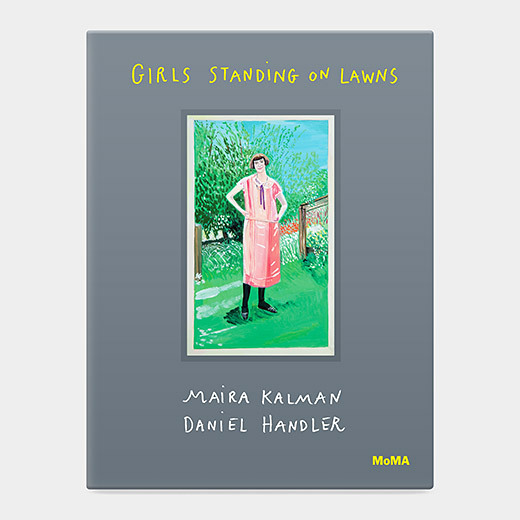 This week’s book, Girls Standing on Lawns, admirably meets the “sweet” and “little” criteria. It’s the first of a MoMA publication series (two and counting—the second, published in 2015, is titled Hurry Up and Wait) blending three creative wellsprings—illustrator Maira Kalman, writer Daniel Handler, and the photography collection at The Museum of Modern Art in New York. As a “sweet little book,” however, GSoL should not be dismissed as vacuous or of interest solely to an under-12 audience. MoMA’s store lists it under both “Kids’ Books” and “Photography.” I might add “Artists Books” or “Visual Essays” or “Anonymous Memoir” if such categories existed. Maybe “Existentialism,” too. Books to read in a poetic/lyrical/pensive/philosophical mood. Many of you probably recognize Maira Kalman. My earliest recollection of her is tied to her late husband, the designer Tibor Kalman, whose firm M&Co was responsible for fascinating objects and graphic identities in the 1980s and 1990s, especially in New York where I was living in the eighties. Maira has evolved into an exquisite visual memoirist and book maker; her style is both naive and illuminating. She makes wonderful kids’ books, but her relatively unburdened take on life translates equally well to books for older readers. Like 40-, 50-, and 60-somethings. 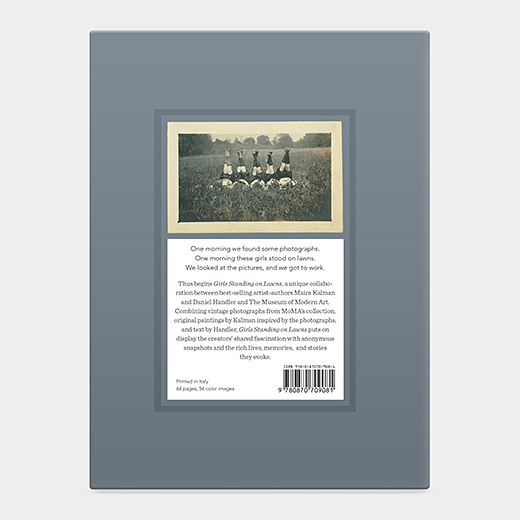 The “we” is the authorial team consisting of Handler, Kalman, MoMA photography curator Sarah Hermanson Meister, and photograph researcher Tasha Lutek. The impulse to work, to “do something,” comes from the images, all of which are anonymous small photographs in the snapshot vernacular. Courtesy of a checklist (typical of an exhibition catalogue, not a kids book) it becomes apparent that the photographs are reproduced life-size, corresponding one-to-one with the originals. (The book itself is a smidge over 8 by 6 inches—my palm and spread fingers fit neatly atop its cover.) I can almost imagine how the prints smell and curl away from the pages. The work, ultimately, lies in the tag-team effort of Handler and Kalman. The writer guides us, offering observations that cluster and loosely categorize the images, voicing the women of all ages who are standing, eternally, on lawns (and an occasional porch or sidewalk), in the photographs. Kalman, meanwhile, escorts selected images into another realm, a multi-chromatic one fashioned by her own talented eye and hands. She bestows a humble glory upon the lawn-standers by transforming their mundane and familiar spaces into exalted scenes. Seeing an original gelatin silver print side-by-side with her rendition of it, I’m reminded of the moment in Mary Poppins when Burt, Mary, and the Banks children jump into sidewalk chalk drawings to visit the pastel worlds therein. Something about Kalman’s interpretations of these images strikes a chord. She loves these women. She understands these women. She sees these women looking back at her, and is thus compelled to do well by them. Sweet, sure, and simple. But profoundly rare at the same time. Like great poetry or the accidental dancing grace of falling leaves. p.s. This note was to have been published January 21 as Book of the Week number three.